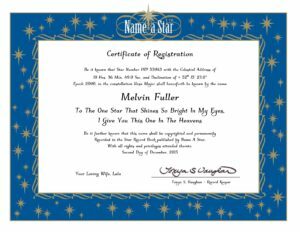 Name a Star – The Original Star Naming Service – Since 1978® maintains this web site as a service to our customers, so you can buy a star name for any occasion. We invite you to visit frequently to browse through our pages and download and copy materials for your personal use, subject to the restrictions listed below. Name a Star does not claim to be the official star naming agency. Only the International Astronomical Union is authorized to name celestial bodies. With Name a Star, it’s the idea that counts… and the joy that comes from naming a star after someone special and giving a little piece of heaven. At Name a Star, our primary purpose for doing this wonderful work is to bring joy. Your satisfaction is guaranteed. If you are not thoroughly satisfied, please return the Package for a refund of the purchase price, less shipping. Information and documents provided on this web site are provided “as-is,” without warranties of any kind, either express or implied, including without limitation warranties of merchantability, fitness for a particular purpose and non-infringement. Name a Star uses reasonable efforts to include accurate and up-to-date information on this web site; it does not, however, make any warranties or representations as to its accuracy or completeness. Name a Star periodically updates the information on this web site. Name a Star assumes no liability or responsibility for any errors or omissions in the content of this web site. Your use of this web site is at your own risk. Under no circumstances and under no legal theory shall Name a Star, its suppliers, or any other party involved in creating, producing, or delivering this web site’s contents be liable to you or any other person for any indirect, direct, special, incidental, or consequential damages arising from your access to, or use of, this web site. If your elect to pay with a credit card, ATM card, debit card, check card or other electronic method, your are authorizing Name a Star to do a one-time debit of your checking account or credit card, which ever was selected, without a signature as provided under the phone, fax and e-mail payment regulations established by the Uniform Commercial Code. This page contains information on material that is protected by copyright, including instructions on how to obtain permission to use copyrighted materials, information on the use of trademarks, and general legal information. You may not reproduce, copy or redistribute the design or layout of the Name a Star™ web site, individual elements of the web site design, or Name a Star™ logos without the express written permission of Name a Star. The Name a Star™ content you wish to use. Name a Star reserves the right to refuse permission to copy, distribute, broadcast, or publish any of its copyrighted material. Use, reproduction, copying, or redistribution of Name a Star™ logos is strictly prohibited without written permission from Name a Star. Name a Star – The Original Star Naming Service – Since 1978® and Name a Star™ trademarks identify Name a Star™ products and services and let the public know the source of those products and services. You may make fair use of our trademarks in advertising and promotional materials, and in referring to our products and services without our permission, provided you follow standard trademark usage practices and provide proper use. In a non-Name a Star™ brand product name or publication title. In a manner that implies inaccurately that we sponsor or endorse, or are otherwise connected with, your own activities, products, and services. In a manner that disparages Name a Star. To identify products or services that are not Name a Star’s. List other Name a Star™ brand product names used in your document that are also trademarks of Name a Star which may be registered in other countries. This web site contains links to third-party web sites. The linked sites are not under the control of Name a Star. Name a Star is not responsible for the contents of any linked site or any link contained in a linked site. Name a Star is providing these links only as a convenience, and the inclusion of a link does not imply endorsement of the linked site by Name a Star. Name a Star is not affiliated with any other star designating company, service, organization, or any government agency. The software and documentation available on this web site are “commercial items,” as that term is defined in Government Regulations. All US Government end users acquire the software and documentation with only those rights set forth herein. This web site (excluding linked sites) is controlled by Name a Star from its offices within the state of Oregon, United States of America. Whereas various locals have laws that may differ from those of Oregon, by accessing this web site both you and Name a Star agree that the statutes and laws of the state of Oregon, without regard to the conflicts of laws principles thereof, will apply to all matters relating to use of this web site. You and Name a Star also agree and hereby submit to the exclusive personal jurisdiction and venue of the Superior Court of Deschutes County and the United States District Court for Oregon with respect to such matters. Name a Star makes no representation that materials on the web site are appropriate or available for use in other locations, and accessing them from territories where their contents are illegal is prohibited. Those who choose to access this site from other locations do so on their own initiative and are responsible for compliance with local laws. In addition, software available on this site is subject to United States export controls. No software from this site may be downloaded or otherwise exported. To other country or to a national or resident thereof to which the United States has embargoed goods. By downloading or using the software, you are agreeing to the foregoing and you are representing and warranting that you are not located in, under the control of, or a national or resident of any such country or on any such list.